Speeches and Gary McHale’s letter to OPP Commissioner Chris Lewis after the protest. These are also the people whose lawlessness is directly supported by radical unionists, anarchists, terror group supporters, Palestinian groups (w/ties to the Muslim Brotherhood, Hamas, Hezbollah, and other anti-Israel groups. Watch the Caledonia: No More Nightmares video below and be shocked. Reference citations are in the 36 page PDF for the event. The Canadian Auto Workers (CAW) is just one of the radical unions who have supported the Caledonia lawlessness. Shame on the CAW and your fellow travellers. If this was 1963 I suspect you and the violent native supremacists you’re supporting would be wearing white hoods and burning crosses. My father was a union rep at Stelco and a supporter of the NDP and I’m pretty sure he’d say that every union who supported the lawlessness in Caledonia was an embarrassment to the labour movement, the party, and was a traitor to working people. I know I think so. 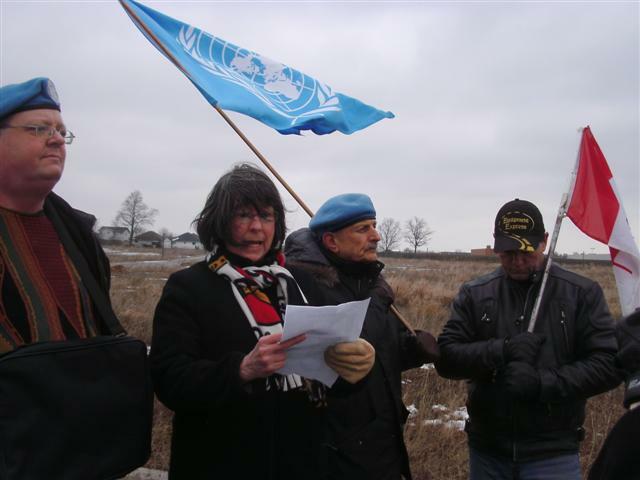 Haldimand resident and Caledonia 8 member Bonnie Stephens attempted to read Never Again Group member Stuart Laughton’s speech from our Feb 10/12 Queen’s Park news conference, but was shouted down half-way through. Since the occupiers refused to let us speak we moved even further down the road until we were within 100 ft or so of the house as you can see from the photos. There, we and the OPP officers were assaulted with a large number of officers present but, instead of arresting the perpetrator, the OPP arrested Gary McHale because we and they were being attacked. Truth is today the majority of Six Nations people who I’ve spoken with are fed up with the protests, fed up with these groups of people and individuals claiming to speak for them and fed up with the smoke shops on Highway 6. So people who fear another Caledonia can put their fears to rest. Perhaps Six Nations should take up a petition to ban Ruby Montour? 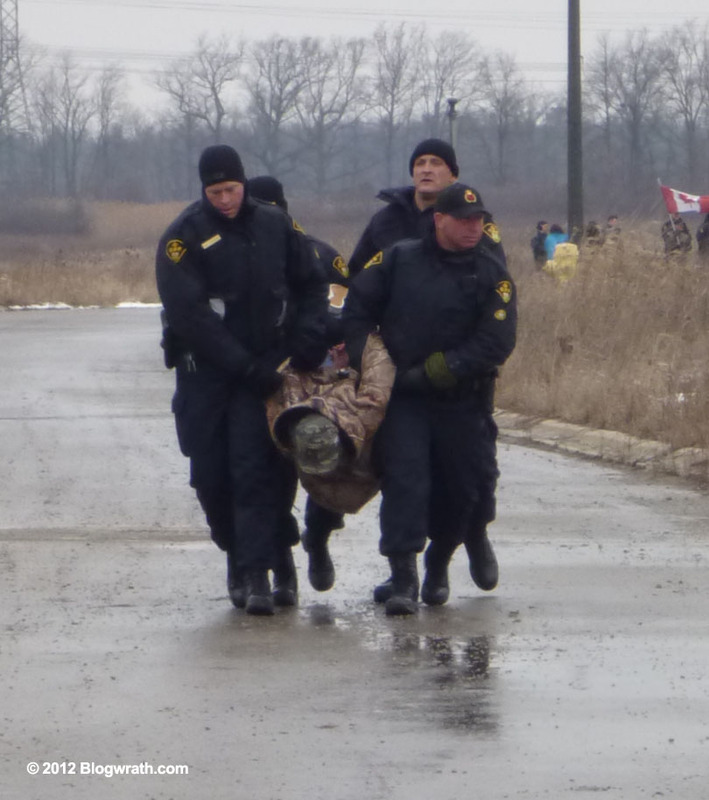 Toronto blogger Miroslav Marinov, editor of Blogwrath.com came to Caledonia and captured this terrifc frontal picture of 4 OPP officers carrying the native woman – Teresa Jamieson – who asaulted Gary McHale out of the DCE. Miroslav has come to Caledonia a number of times to cover the story. David Strutt, creator of the fabulous Caledonia cartoons on VoiceofCanada [LINK, LINK], came from out of town to record the historic event in high resolution photos. CANACE videographer Jeff Parkinson [ALSO] wasted no time getting the preview above edited and online at his canaceHD page so readers could get a small taste of the abuses heaped on us today. Jeff will make more footage will be available which will be online in a few days. The OPP kept McHale for several hours before releasing him. 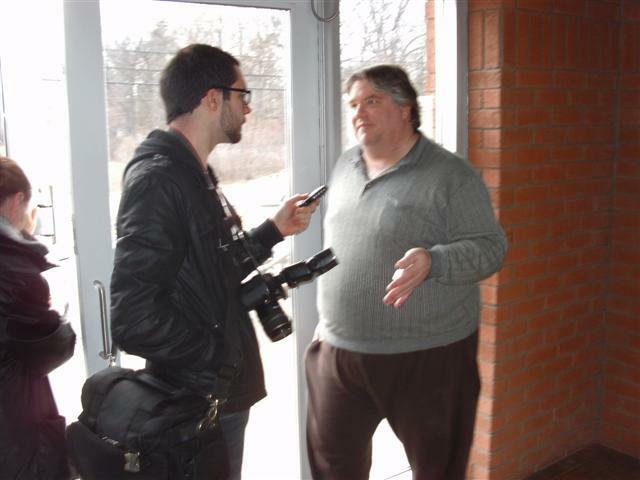 He was met at the Haldimand OPP detachment by supporters and a reporter for the Dunnville Chronicle (R) after this, his 6th arrest by the OPP without a single case making it to trial. Thank you to the residents of Caledonia who came out, especially to the wife of a loyal supporter who helped us make a little history during her very first event. It is great to know we can count on you. Your town should be proud of you. This entry was posted in 1. VoC's MOST IMPORTANT POST, 2. VoC's Favorite Post, Anarchists & Unions in Caledonia, Applying Martin Luther King Jr. methods, Blogwrath.com, Bonnie Stephens, Caledonia 8, Caledonia Players, CANACE News, Christian Peacemaker Teams, Civil Rights Protests, Crimes Against Democracy, David Strutt, Doug Fleming, Gary McHale, How low can they go?, Human Rights Protests, Jeff Parkinson, Mark Vandermaas, Merlyn Kinrade, Moose FM, MUST SEE, Native Lawlessness, Native Protests - Caledonia, Native Racism, OPP orders - Racial Policing, Planet Earth calling, Racial Policing, Randy Fleming, True North - NOT free!, URGENT NEWS, VoC News, VoC speeches and tagged CAW, First arrest of native occupier, Walking on Douglas Creek Estates. Bookmark the permalink. Gary, as usual your courage and your fellow Canadians like Kinrade are truly exemplary. That a coward, thief and liar like McGuinty is the premier of Ontario is just an indication of how powerful his supporters like CUPE, CAW and other parasitical unions are. All the best in your lonely fight against tyranny. I will continue to send my funds to help in your fight. Thank you Mark, Gary and all for everything you are doing to help Caledonia and all of Haldimand County. Why are there so many stupid people out there that they can’t see the corruption in land development? Now you’re donating to it. This is native land and it should stay that way. Biggest myth of all – that 6N were indigenous, or were ‘First Nations’ and that they have a valid claim in Caledonia, etc. Sorry, Wayne. April 12, 2012 Dalton and his band of thieves are at McMaster. We ar egoing to protest health care, any one else want to join???? ?